Damien Hirst, the artist who famously built his global brand with an art production line, sales and marketing team, administrative sector and finance and investment division, is streamlining his business to “focus on his art”, according to a spokeswoman for his company, Science (UK) Ltd.
As part of the restructuring, the British artist has laid off 50 members of staff, mainly working in finance and IT, although there have also been some losses in his London and Gloucester studios. Directors James Cameron, Jude Kelly and Sylvia Park all left the firm last year. The spokeswoman declined to comment on current staffing figures. Investments are instead being made in a new studio on Beak Street in Soho, central London, which Hirst bought for around £40m, according to Companies House. The new complex is expected to open next year after extensive renovations and is set to become Hirst’s flagship studio in the UK capital, comparable in size to his workshop in Southwark, south London. The artist’s recent return to painting is well-documented, but the company’s restructuring will not mean an end to pickled sharks and cows cleaved in two. Hirst’s spokeswoman say he will continue to create large conceptual sculptures and installations for collectors; he recently redesigned the bar at the Palms Casino Resort, complete with trisected shark, as part of a $620m renovation by the art-loving brothers Frank and Lorenzo Fertitt. To this end, Hirst is due to shut the Quay restaurant in Ilfracombe, Devon next month; some of the redundancies are a result of this closure. According to sources, he is refurbishing several properties on the seafront which he will either rent or sell. However, Verity, Hirst’s imposing bronze statue showing a cross-section of a pregnant woman installed near the restaurant, will stay put; the 25-tonne statue is on long-term loan to north Devon council. Hirst shut his Other Criteria gallery in Ilfracombe last year, but the publishing company continues to produce books and catalogues. The £25m Newport Street Gallery, which Hirst opened in Vauxhall in 2015, ostensibly to showcase his Murder Me collection, will also continue to operate as normal. Hirst’s decision to go back to basics comes exactly ten years after his infamous Beautiful Inside My Head Forever auction at Sotheby’s London on 15 September 2008, which netted £111.4m over two days. The sale unfolded just as the financial markets collapsed amid the subprime mortgage scandal, marking the end of an era of decadence for the contemporary art market. A recent report on Artnet found that 19 works by Hirst from the Sotheby’s auction have since been resold, 17 of which have depreciated in value, with a collective loss of almost £2.2m. Collectors’ wallets are likely to have been dented further by fees and storage costs. According to a mockumentary released by Hirst on Netflix in January, the artist ploughed the profits from the sale into his most ambitious exhibition to date, Treasures from the Wreck of the Unbelievable, which closed in Venice in December 2017, racking up a reported £250m in sales. As for the state of his market a decade later, Hirst recently took to Instagram to address his critics. He recalls how he was playing snooker with world champion Ronnie O’Sullivan during the Sotheby's sale while someone was reading out the hammer prices. “I couldn’t even process it–it was going crazy. 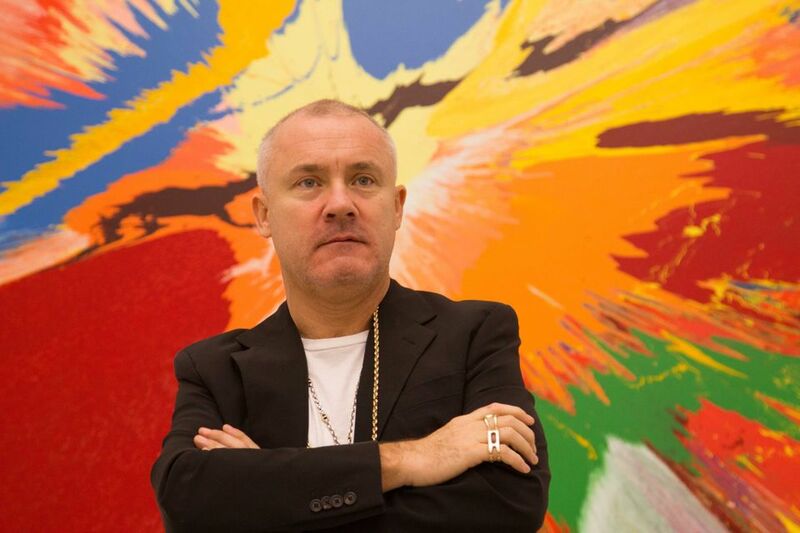 I kept saying ‘they’ve got it wrong’, I couldn’t make sense of it because the prices were so high,” Hirst says.